Interests - Loves cooking/decorating cupcakes, doing puzzles, playing with paints etc, dolls and dressing up things, stickers and sticker books, Minnie Mouse, hairbands, make-up, anything girly, Tatty Teddy. Playing on the Nintendo DS and Nintendo Wii (especially dancing games), Puppy In My Pocket and Zhu Zhu Pets and Puppies, loves the tv programs Tracy Beaker and Dani's House. Megan was diagnosed with Neuroblastoma stage 4 in September 03, she was 6 months old. Megan’s tumour was in her chest compromising her breathing. Megan was transferred to London’s Great Ormond Street for treatment. The tumour in Megan’s chest was crushing all of her internal organs, making her unable to breathe on her own. She had to spend 2 weeks on a ventilator. Eventually with chemotherapy the tumour was starting to shrink and Megan could be taken off the ventilator. She then had to have Chemotherapy to try and shrink the tumour in her chest and clear her bones, bone marrow and other organs of the cancer cells. This was a very rough time on the whole family, Joe had to go and live with my mum and dad for seven weeks. Following chemotherapy test revealed that the tumour had shrunk and that the bones were nearly clear. Two more rounds of chemo would be done and then Megan would have surgery to remove the tumour. Surgery was scheduled for March the 26th 04, before surgery Megan had to have an angiogram and there was concern that a main vessel was running through the tumour. The angiogram showed that aorta was running straight through the middle. This would make surgery more difficult. Megan had surgery on March 26th, the operation was very successful, doctors managed to remove all the tumour apart from the small amount in her spine. Surgery was a complete success and Megan didn’t need any more treatment. Megan is currently NED which is the equivalent of remission. Unfortunately due to spinal cord compression Megan has been left paraplegic has spinal scoliosis, and neuropathic bladder and bowel. We are just waiting for a wheelchair which should make life a lot easier for her and prevent her from getting so frustrated. She goes to a special needs nursery which she really enjoys. Megan has a 20-30% chance of the Neuroblastoma coming back and she has to have MRI’s under general anaesthetic every 4 months. She is a very happy little girl who enjoys life, but does get frustrated as she can’t do more. Megan has just spent 2 weeks at Stanmore royal national ortheopedic hospital for intense therapy. She can now dress herself and has been learning to swim. In 4 days she has earned not only her 5 meter badge but also her 10m and I’m so proud. Stanmore have also decided Megan should be wearing a spinal brace again. It has been a tough month for Megan. Following her spinal fusion in October we have had problems with the wound. The stitches popped at the bottom of the wound and we have had several trips to A&E and GOSH. After what felt like several wasted trips we saw the spinal surgeon. He said that the wound would heal but would take a long time and wouldn’t be so neat. He felt the best thing was to re-operate and clean things up and re-stitch. This would make things heal quicker and enable her to get back to school. Well, we turned up for surgery and just as she was going to theatre they cancelled. So yes its healing slowly, will be an ugly scar, and I was very cross they cancelled again. We are going to leave things until we see the surgeon in January. I am going to Lanzarote with Joe on Sunday for a week. He’s really feeling the last 9 years and we need time together. I don’t think we realise the effect on siblings. Megan has a very busy week when I’m away. A very special day which i am unable to share at the minute but will very soon. Thank you for our post and to Becki for the personalised tatty teddy card. Massive thank you to Lisa Archibald for the fijit she sent Megan. Lots of giggles coming from behind the bedroom door! Well, where to start? Megs was finally admitted to GOSH for a spinal fusion October 17th. She went to theatre around 10.30am and we didn’t get to see her until 5.20pm. It was the longest 7 hours of my life. Anyway, the surgeon was happy with how it went. She didn’t recover so well initially though. She was very poorly, in pain, and kept spiking a temperature. Slowly but surely we got there and came home after 8 days. We’ve had some healing issues and been to A&E a couple of times. The wound has opened at the bottom and we’ve had to be reviewed at GOSH today. The stitch was exposed so that has been removed and the wound had a good clean. The spinal fellow has said the wound will take ages to heal and no baths for a while. Also, there are some concerns about her circulation as one leg is hot and one ice cold, so we need to keep tabs on that. Massive thank you for messages of support and cards, they have really lifted Megs spirits. She’s been quite down and she loves receiving posty. Also, huge huge thanks for the dog balloon from Post Pals. We have exciting news next month, so watch this space. Well Megan was due to have spinal fusion done on September 26th. GOSH cancelled less than 24 hours before surgery. Megan was upset as she had been all prepared. I was completely devastated and cried buckets for about 4 hours. They have rescheduled for October 17th but i don’t trust them until she’s in theatre now. So, we have to keep her germ free now which isn’t going to be easy considering everything that is flying around. We have ongoing issues with Megan at school at the minute. She is really struggling being the only child in a wheelchair. She feels she has no friends and it is all because of the chair. We’re not sure how to deal with this but maybe some time off to have surgery will give her time to think. Thanks for the post, Megan received some Tracey Beaker dvds that she loves! Firstly I’m sorry for the lack of updates. I have been going through an extremely difficult time. We have had a very busy summer. We went to Hunstanton for a week to families against neuroblastoma holiday caravan. We had an amazing time and the weather was fairly kind to us. We went to the sealife centre, boat trips, theatre and spent time on the beach. There was another family staying in FANS other van next door and it was lovely to spend time with them. We talked about the kids illness and catheters and it just seemed so normal. Health wise Megan is doing ok i guess. She has actually got a dislodged spinal rod so won’t be having her lengthening this month. The doctor feels she has little growth potential. He says the best thing would be a spinal fusion. I was devastated to hear this as she is still only 9. Anyway, long story short, we have decided to go with their decision. Megan is having her spine fused on September 26th. Im very anxious about this but know it is the right decision for her. We will be spending a minimum of 10-14 days in GOSH. Megan had an amazing birthday; I can’t believe she is 9 already. She had a surprise party in the hummer limo that did the Jeremy Kyle show. It was a surprise and she was thrilled. Thank you for the lovely cards she received. Megan has been doing her own catheters via her mitrofanoff for about a week now. She is so independent and coping really well. Its taken a while but i can now see the huge benefits. She has also just been reviewed and has been given a new spinal jacket. It is hard at the back and a corset at the front so hopefully she will tolerate this one. We haven’t been doing much over the holidays. Mick’s mum has been very poorly so we’ve been at the hospital. She’s having tests but looks like it could be bowel cancer. Megan and Joe are both very upset but doing ok. Thank you for the continued support and a massive thank you for the letters from Dottie, Megan loves getting them. Well, where to start! I have so much to tell you all but at the moment it is a big secret so will share with you all next time. Megan is doing ok; she has now started the hormone injections and seems to coping fairly well with no side effects. I will be doing the next injection with the community nurses and then I’m going it alone and Megan will be much happier with this. I have to say she was a complete superstar when she had the first one jab, no tears or anything. Well we’re going to pre-op next Thursday at Great Ormand Street and then surgery the following week. She is having a Mitrofanoff/ACE and bladder augmentation. She will be in for about 10-14 days if all goes well and then lots of TLC at home until the end of January. We’re very anxious about this op but Megan can’t wait to see the after effects and hopefully be more independent. So, the hospital will be home from 22nd November for 2 weeks or so. We’re still waiting for appointments with orthopaedic surgeon and neurodisability team. Nobody seems to know anything which is frustrating as we need to see them ASAP. On a high note, Megan’s school is finally adapted (well, nearly). Major building works have now been completed and it is all the small jobs that are being finished off. We have 2 lifts and Megan is finally, after 4 years, able to access the school on her own now. Well, I will update next time with our very exciting news! Huge thank you, as ever, to Wendy who continues to send hand made cards to Joe and Megan, they’re always gorgeous. Huge thank you to Viks too for the flutter fairy. It always brings a tear to my eye to read some of the other kids’ updates and the kindness that strangers always show to them and Joe and Megan too. Well, what a hectic summer. Megan had spinal surgery at the end of July and is recovering well. They managed to extend by 7 mm which is great. Sadly, we had a rotten time in GOSH this time. The anaesthetist knocked her tooth out and didn’t realise until we saw her chewing it. It could have been so dangerous. The ward had no pillows and was being run by agency nurses who didn’t know anything; it’s fair to say we were pleased to come home. Megan’s MRI of her brain came back normal which is a huge relief. She is going through early puberty and needs to start hormone injections next week. I am going to do them as Megan is needle phobic and would rather this. We’ve also had an X-ray done of her hips which shows they are subluxed and she is now being referred to the orthopaedic surgeons. Joe had a busy week at the beginning of the holidays. He went away with summers trust, which is a charity that provides activity holidays for young caters. He had an amazing week and didn’t phone home once! He is starting high school on Wednesday and is terrified. I’m sure he will be fine and make lots of new friends quickly. To finish off the holidays we are going to London on Saturday. We’re planning to go on the eye, river cruise, pizza express for lunch followed by the aquarium. A lot to do in one day! Thank you to all you amazing people who continue to put a smile on Joe and Megan’s face. Also massive thank you to Debbie who sent a card to me and Mick letting us know it was her first time posting to a Pal and wanted to check she’d sent the right things. Honestly, a cheery letter really makes a huge difference. Huge thank you to the cards sent for Joe’s birthday too. Viks we can always rely on you for some confetti all over the floor! Megan wants to say a huge thank you for regular updates from Dottie, she gets really excited when Dottie’s letters arrive. I can only apologise it has taken so long to do an update. Things in our household have been hectic to say the least. Megan had an amazing birthday in March and thank you to everyone that sent cards for her. Megan has recently seen the Hormone specialist and they have referred her for some tests to determine if she is going through early puberty. She will be having an ultrasound of her pelvis and blood tests done on 6th May at GOSH. If the results come back positive then she will need hormone injections to stop this happening until she is about 12. Megan has also recently been reviewed by the Spinal injury consultant at Stanmore. They are very concerned about her posture due to the leg spasms and scoliosis. Although the scoliosis is managed through spinal rods, her pelvis appears to be completely offline with her trunk. One of the biggest issues we have is trying to get good enough correction with the wheelchair. 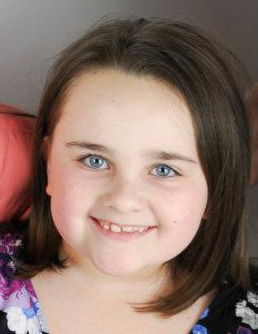 The specialist is going to speak to GOSH and decide whether Megan should be fitted with a Baclofen pump. They feel that this would help the spasms in her legs which in turn will help with spasms in her trunk making her so lopsided. We are a little unsure of which way to go with this; it would mean more surgery for Megan to endure so we need to speak to the team to see the best way forward. Megan is due to have some more Botox in the summer but we’re just waiting for a date. Megan will be due more spinal surgery in July to lengthen the rods, but again we’re waiting for a date. The bowel and bladder problems have got worse and this is something I need to speak to GOSH about. She is leaking in between catheters and having more bowel accidents at school. This of course upsets her and she wants to know when she can have the Mitrofonoff/Ace procedure done. Again, she is on the waiting list but no-one seems to be able to tell me when this will happen. Everything seems to be a waiting game but this makes for a very unhappy Megan. Joe was refused his place for high school so I’m having to battle this one also. He is the only child in his class that didn’t get his first or second choice. He has been offered a school the other side of Croydon which would mean he has to get 2 buses on his own each way everyday. The council might think he is old enough to do this but I’m sorry the world is a scary place and it just isn’t happening. I have applied to appeal and again I’m just waiting for a date. Joe was very upset by this decision as you can imagine. He cried solidly for 12 hours and had to have a day off school. I have recently spoken to his teacher who has said that his behaviour has changed since hearing the news. He isn’t being naughty and continues to work hard, but is beginning to talk a lot more and the teacher has just noticed a change in his mood. I really wish the people on the panel at the council could see how much he has already been affected by Megan’s illness/disability. I had a supporting letter from our GP but have been told it can’t be forwarded to the appeals team as there is no medical reason for him. I was really hoping that for once someone would give this family a break and not make us fight for everything. Huge thanks for the Easter parcels that were sent to both Joe and Megan. Joe loved receiving the homemade cake lollies. Megan received a lovely big parcel containing lots of Easter crafty packs and chocolate. This kept Joe and Megan quiet for ages and gave me some peace! We had a very quiet Easter break at home but did manage to go to Littlehampton for the day then a meal on the way home. The weather has been superb so it is just been nice to have fun in the garden. Mick is going for a week respite break in May with friends to Spain so I’m home alone with the kids. I’m secretly dreading it as know I will miss him like mad and will have no help with Megan’s day to day needs. The lifting is the biggest issue, but on the plus side I will be having a week respite in June. My sister and I are going to Portugal for a week, again I will miss everyone like mad, but the break will not come soon enough. A massive thank you to Jane for the bracelet she sent through for Megan. Megan is convinced she went all the way to Lanzarote especially to get Megan her pressie, she loves it. Also, a huge thank you to everyone that continues to send posty to Joe and Megan. I’m not going to name you personally in case I forget someone, but you all make a huge difference to their lives. Joe and Megan especially love the post from Jane and Megan loves hearing about what Dottie has been getting up to. Rufus has been a little lazy lately but I have plenty of photos which I must forward on and add to his facebook page. I can only apologise for no update for December, I thought it had been sent off and have just found it. Thank you to everyone that sent cards and gifts to Joe and Megan. Megan had a dreadful Christmas and spent most of it unwell. She woke Christmas morning being sick and was ill for about 8 days. I’m fairly sure she had swine flu. We have had many appointments with Megan already this year. Megan is officially now on the waiting list for the Mitroffonof/ACE procedure. I spoke with Great Ormond Street and have been advised that surgery is likely to take place in September/October time. They have said surgery will be about 6 hours and she will be in hospital anywhere between 2-3 weeks, all being well. They have advised she will probably be off school for anything up to 3 months. I am dreading the surgery but know it is the best thing for Megan in the long run. We are seeing the Botox team for assessment next week; her legs seem really tight so not sure how much they think the botox has helped. We’ve had huge problems with Megan’s wheelchair; she really has grown so much. After countless phone calls Megan is now the proud owner of a new 15″ chair. We are still waiting for a special back and cushion but she is much more comfortable now. Building works should commence very soon at school so hopefully by September Megan will be able to access all parts of the school by herself. Megan has really been having a very tough time lately. One of her friends at school had a birthday party and Megan wasn’t invited (one of the only ones not invited). She was absolutely devastated and had a dreadful day at school on the day of the party. All the kids were talking about the party and Megan’s carer said she was very sad and upset all day. She is blaming her wheelchair and saying she feels really left out. We picked her up after school and she spent nearly 2 hours screaming, punching telling me it was all my fault she is in a wheelchair and had cancer. It was so upsetting to see her like this but how can I deal with it? I know things will get far worse before they get better and this will happen again. We are due to see the team at Stanmore in March so I’m going to organise for her to see the Psychologist. She explained to me a while back that it will come to the point where Megan blames me and gets very angry about her illness/disability. I really didn’t think I would be dealing with that now though. Thank you to everyone that continues to send posty, it really brightens the darkest of days. Thank you for all the postcards Megan has received, she loves seeing all the different countries. Thank you for Megan’s disposable camera, she is having so much fun snapping away. Also a huge thank you to Jenny for Joe’s Autograph book and photo album. We have had a few tough weeks with appointments etc. We saw a bowel specialist at Stanmore. Due to the location of Megan’s spinal injury her bowels will always be erratic. If the damage was higher or lower her bowels would be more manageable. The specialist feels Megan’s best option is to have the ACE procedure. This will be done at GOSH. We also saw an Urology registrar at GOSH on Monday. Unfortunately the specialist wasn’t there so no final decisions could be made. The registrar has said that Megan will need a Mitrofonoff and she has been put on the waiting list. All we have been told is she will be in surgery for 5-7 hours. I have been looking into both procedures and it is major surgery. They will also enlarge her bladder at the same time. We are terrified at the thought of what she will go through but know that the long term benefits far outweigh anything else. Megan is due to have spinal surgery on Tuesday. We’re still waiting to hear if this will go ahead with the recent weather. Joe and Megan have enjoyed having time off school this week. We have managed to get Megan out in a sledge and they have both loved playing in the snow. Thank you to everyone that has sent card/letters/gifts to Joe and Megan. A massive thank you to Dottie for all the updates and a huge thank you for the tatty teddy smelly set Megan received. Well, we have just returned from spending a week at The Thomas Ball lodge in New Milton Hampshire. We had an amazing time and the weather was amazing for this time of year. We tried to arrange to meet Dottie as she only lives around the corner but unfortunately couldn’t organise it. Megan seems to have a bug in her bowel and is having very large accidents 4 times a day. This upsets her so much as she is missing out on so much and was unable to go swimming whilst on holiday. Despite this we all had a great week; we went to the beach, spent a day in Poole, went pumpkin picking and then carved them. The hot spot of the whole week for Megan was busting some moves with Sammy seahorse. She really is a disco diva and purple people eater is her favourite party dance. Back to reality and we’re going to Stanmore spinal unit tomorrow for 1 week. Megan is having intensive rehab so not really sure what to expect. I’m sure it will be a tough week but we will all gain so much from being there. We also have a date through for Megan’s next spinal op – December 7th. Not the best time as it means Megan will miss out on Christmas activities at school but it needs to be done. A plus for the whole family will be a new arrival very soon. Megan’s big sister, Jenny, will be having a little boy in the next few weeks. She isn’t due until November 19th but has been suffering with very high blood pressure so it looks like she will be having a sweep tomorrow. We’re all really excited and can’t wait to meet their little boy who they will be named Alfie. Jenny has asked me to be a birthing partner along with her husband. I have always wanted to be a birthing partner so think I may be spending my week driving backwards and forwards to Stanmore so I can be there. Thank you to everyone who continues to support us as a family. Megan received a lovely postcard from Dottie playing in the autumn leaves – she loves it, so thank you for those huge smiles Dottie. Thanks to Dottie AGAIN for all your letters. Megan loves telling Rufus what has been going on. A huge thank you to Kate Dee for the lovely Halloween goody bags Joe and Megan received. Firstly sorry for the late update, I’ve been in Cyprus for a wedding so unable to send one. Things have been fairly hectic for Megan lately. We’ve had lots of appointments and procedures over the past month or so. On a high to begin with, Megan had Botox injections into 3 different muscles in each leg in September. Following a follow up appointment yesterday, it has shown the Botox has been very successful. The measurements in her hips, ankles and knees have improved amazingly well. We are so pleased and also she seems to have fewer spasms in her legs which is great. We finally managed to have her surgery last week to insert SP lines into her bladder. These were put in so her bladder pressures could be measured following how unpredictable her bladder has been lately. She has been having lots of accidents in-between catheters lately which have really been getting her down. At first we thought this may have been to do with a recurrent urine infection she has been getting. She’s had 4 lots of antibiotics for E-Coli in her urine over the past month. Anyway the tests have shown that Megan bladder is actually too small for her age etc. The specialists want to meet with us to discuss surgery. The want to give her a procedure called ‘Mitrofonoff’. I’m not really sure what this involves but know it is major surgery where they will re-route things so she can do her catheters through a hole in her tummy. At the same time they want to enlarge her bladder using her intestines. If she has this surgery then they also want to do some bowel surgery. I know even less about this surgery other than it is called the ‘ACE’ procedure. I know both surgeries are major operations with risks but they could give her quality of life and a lot more independence. GOSH are concerned about how all her treatment/operations over the years have affected her physiologically. She is very anxious whenever she is having anything done now. She’s very low about everything at the minute and questioning her disability almost everyday. She’s beginning to get very angry about day to day things. I know it will get harder before it gets easier but it is tearing me apart seeing her suffering like this. I’m going to have a chat with the psychiatrist at Stanmore and see what she recommends. Megan is being admitted to Stanmore hospital on November 1st for a weeks intensive rehab. I’m hoping that she will get a lot out of it and maybe make some friends in the same boat as her. I’m not really sure what to expect yet as it is the first time we’re doing this. We’re also waiting to hear from GOSH about her next spinal operation which will be done Nov/Dec time. Everything is just so busy at the minute, I feel like I haven’t been at home for months. We’re away for half term to The Thomas Ball lodge in Hampshire, both Joe and Megan are looking forward to dancing with Sammy seahorse. The biggest highlight of Megan’s life so far is Rufus. Rufus is a litter mate and was given to Megan by Dottie the Dalmatian. Rufus goes everywhere with Megan, he even shares her bath water. We have set up a facebook page to keep everyone updated on Rufus’s travels. He’s having some lazy time at the minute before he will be very busy looking after Megan when she is in hospital. He’s also looking forward to going to meet Sammy seahorse. A massive thank you to everyone who continues to send posty to Megan and Joe. Megan loved her ‘summer themed box’ and also a huge thank you for the bracelets that Joe and Megan received at the beginning of the week. Joe hasn’t taken his off yet and even hides it under his school jumper. Megan has loved receiving the postcards that lovely people have sent her from all over the country/world this month too. A huge thank you to ‘Dottie the Dalmatian’ for all the letters Megan has received. She loves hearing about all her adventures and finding what all the other ‘litter mates’ have been up to. A big thank you to Kim Lawrence and family for the lovely September themes box. Megan especially loved the pink butterfly lights, she has had them hung from her curtain pole and are switched on every night when she goes to bed. Life has been pretty awful lately and it is amazing everything Post Pals do, they certainly are all part of our extended family. Firstly I want to say a huge thank you to everyone that has sent posty throughout the summer. At the end of July we went to Blackpool for a week and stayed at Haven. It was lovely to finally meet up with Linza Corp who runs Families against Neuroblastoma (FAN). We were lucky enough to meet up at Blackpool pleasure beach and also meet some amazing families. We had a lovely 5 days in Blackpool and Joe and Megan went donkey riding and on lots of rides. The weather wasn’t that great but we did manage to have a day in St Annes and found a gorgeous beach where Megan was able to build some sand castles and Joe was able to fly his kite. We were also able to get a few days camping in Bournemouth at the end of August. Megan and I hated every minute as it continuously rained, but Mick and Joe loved it. Megan was due to go to GOSH for surgery on the 17th August. Because we have had lots of problems with her being wet in between catheters, the doctors wanted to check her bladder pressures. She was due to have SP lines in that would be connected to a machine and this would indicate whether there was any damage to her bladder following spinal surgery. Anyway, long story cut short, it was cancelled due to UTI, as Megan tested for E-Coli in her urine. I was furious as this was diagnosed the week before by GOSH and GOSH prescribed the antibiotics. I had asked if this would interfere with surgery and was told NO. So we spent the night before in patient hotel, got to ward at silly o’clock to be sent home as we were about to go to theatre. We have waited 6 months for this operation and we have rescheduled for October 5th as told them I was not willing to wait. Whilst we were talking to the doctors they started telling us about a couple of operations that may be an option for Megan. We will discuss these at length at our next outpatient’s appointment. They would like us to consider the ‘Mitrofonoff’ (surgery for bladder so Megan can catheterise through her tummy) and also the ‘ACE’ for her bowel. I know very little about either procedures and I will not look on the net as I know both surgeries are major and both have risks. Megan will be seeing the Endocronoligists next Tuesday about early puberty. She is having a bone age scan done beforehand and hopefully we will then have some answers. Her body hair has grown even more over the summer and she insisted we buy her a bra. It’s so sad having to try and explain to a 7 year old why all these changes are happening to her body. She really is too young to understand but we are trying to be as honest as possible with her. If all the tests come back positive next week then we need to discuss how to stop early puberty before it affects her growth. We will also be seeing the Neurodisability team next week at GOSH. Megan is scheduled to have 3 Botox injections in each leg into different muscles to help with spasms next Tuesday. This will hopefully help with her tightness and maybe relax her a bit. We’re slightly concerned as they are being done without anaesthetic. On November 1st we are being admitted to Stanmore hospital for intense Rehab. The spinal injury team have said that Megan must start being braced as the surgery/rod alone is not controlling the scoliosis. So we will be trying different braces, intense physio, trying new equipment and basically trying to make Megan more independent. It will be a very very tough week and I’m sure emotions will be running very high, but I do feel Megan will get a lot from it. On the whole we have had a mad summer with so many appointments and things going on. Yesterday was Joe’s 10th birthday, I really can’t believe how time flies, thank you Wendy for his card. We had a little party at home with family and it was lovely to have good weather so we could get the bbq out. Joe and Megan are both back at school next Monday and we’re hoping for some good weeks now. It’s been a very tough few weeks with Megan and would be great for some time out. She’s really struggling with things at the minute, it is so hard. Thank you for your continued support, it really means so much. Thank you to Wendy for the handmade cards you continue to send Joe and Megan. They really look forward to receiving them and Joe even recognises your handwriting on the envelope now! Megan loved receiving the letter and photos from the Dalmatians. She is soooooo looking forward to receiving her very own puppy to look after. Joe and Megan still love hearing what Percy the poodle has been getting up to as well. A huge thank you for the box Megan received with the summer theme, she took this on holiday with us. Sorry I missed last months update, we have had so much on. Megan has recently seen the long term oncology consultant. This is the first time she has been seen at this clinic. Everyone is fairly concerned as Megan is showing signs of early puberty. She has been referred to an Endocrinologist and will need some tests done. If the tests come back positive then they need to stop it ASAP. We have an appointment for September 7th. We’ve had loads of other follow up appointments but nothing to report really. Megan has recently started wheelchair dancing and loves it. We also have a whizz kid course coming up so it’s busy. We are also going to Blackpool for a few days at the end of the month so that’s something to look forward to. Thank you to everyone who continues to send posty to Joe and Megan. Megan has received lots of stickers and sticker books so she’s being kept very busy. Thank you to Ana for the lovely MEGAN name plate, she has put it on her wheelchair wheels. She loved reading about Ana and looking at the picture of Ana in her chair. Wow it seems i missed last months update, SORRY folks. Megan had a great birthday and thank you for the lovely cards she received. She had a party with her friends in a hall with a disco etc. We ended up with about 50 kids and it was mad but Megan loved it although she spent over an hour crying about her wobbly tooth. Eventually it came out and she made £8.00! Things have been a bit hit and miss lately. Since Megan’s recent spinal surgery she has been having problems with her bladder. It seems the surgery may have caused more damage to her bladder. She needs to have some tests done but they need doing under GA and there is a fairly long wait. She is very upset about all of this and we’re getting all the WHY questions. She’s feeling very angry and upset she had cancer, angry about being unable to do certain things. It’s heartbreaking to hear all this but I’m sure things will improve. She’s also been seen by a new specialist at GOSH about the spasms in her legs. They feel Megan will benefit from having some more Botox. She is on the waiting list which is about 4-6 months. We’ve also just found out that Megan’s school is going to be fully adapted. Completion date will be Easter 2011 but will include a lift, hygiene room, ramps (basically everything that will make the school completely accessible). It’s a huge project as they’re also building new classrooms, ICT suite, playground, toilets. I finally feel that after 3 years of fighting the LEA, I’m finally getting somewhere. Megan’s older sister Jenny got married at the beginning of April and she was very excited about being a bridesmaid. Joe was a pageboy and looked very handsome. We have also found out that Jenny is pregnant and due around November so they will be an uncle and auntie. We’re all really excited and feel we have something to look forward to. Megan and Joe were so excited to see themselves on the TV on the Russell Howard Good News show. We have had so many people saying “we saw you on TV last night”. They have both had so much posty and mega smiles. Thank you to each and every one of you; if I forget anyone in the following list I’m really sorry. Right, here goes, David and Sandra, Karen Thatcher, Nicola, Charlie and Tilly the dog, Leah, Grannie Ruth, Elizabeth from New Jersey USA, Catherine Hill, David, Jen Steve and Lily, Wendy, Izzy, Charlotte, Yenti, Carole, Tanya, Anna and Jenny, Jacqueline, Phoebe, Claire Hastings, Dexter and his mummy, Liz. Also a big thank you to Emily and Fiona for the lovely box of girlie bits, Megan loves the hello kitty lip gloss and jewellery. Megan also received a huge box of bits from a lovely lady called Karen. Karen sent Megan a lovely card telling her all about herself and also that she is a policewoman. Megan loved the flashing bunny ears, wings, tiara and all the other bits and pieces. Again, if I have forgotten anyone I am truly sorry. You are all amazing people and have certainly created lots of smiles in my house this month. It has been a very tough month for Megan and from the bottom of our hearts, thank you. We have had a very busy month including a few routine appointments with wheelchairs and local paediatrician. We’re still waiting for some hormone results to come through but it should be through any day now. Half term was fairly quiet as the weather was so lousy as usual. On 23rd February, Megan was readmitted to GOSH for her spinal surgery. We were very lucky as she was first on the list so we didn’t have to wait around too much. She had her pre-med as usual and was very giggly. We saw a different anaesthetist who was new to GOSH and he was really lovely and let Megan be in complete control and make decisions about how she went to sleep etc. Surgery went well and she was sitting up in bed by the afternoon eating everything in site. She has never been like this before and it was lovely to see. I think we spoke to soon though as the next day was awful, she was very sick all day and the wound had been weeping over night. All in all it was a horrible day for us all and it just happened to be my birthday as well! Megan has been recovering very well at home and had her dressings changed yesterday. All looks nice and dry and she was able to have a bath last night. I think she may have had the start of an infection as there was hard green puss under the steri- strips. Anyway, she’s doing well and returned to school this morning. We have to keep an eye on the wound as it was bleeding overnight. On a brighter note, Megan is looking forward to her 7th birthday next Friday. We have a party booked for the 13th and she will be having a disco and face painter. We’re expecting about 50 kids so I’m sure it will be eventful. Thank you for the continued support you all show to us. It really helps and shows how much people care. A huge thank you to Sara, Kelvin and Megs for the Chelsea stuff and DVD you sent through for Joe. Also a huge thank you for the Minnie Mouse hidden inside the red love heart – she loves it. Megan had her spinal surgery on Tuesday and all went fairly well. She was in a lot of pain when she woke but it seemed to be managed with Morphine. Mick stayed with her Tuesday night as it was my birthday Wednesday. On Wednesday morning the wound had been weeping and she started being sick. She was sick a few times throughout the day and it looked doubtful we would get out. Anyway, we got out about 5pm last night. She had a fairly settled night but the wound seems to be weeping a little this morning. She’s slept a lot today and is a bit hot and looks very pale. We’re going to monitor how she goes and get the nurses to check the wound if it weeps again. We’re really hoping it doesn’t otherwise she’ll probably be back to hospital for IV antibiotics. She normally recovers really quickly but this time, bless, her she’s really struggling. We were prepared for a busy month with appointments but unfortunately had to cancel them due to the snow. We managed to see the local paediatrician for a general catch up though. Megan had developed some body hair unusual for a little girl of her age. The paediatrician has taken a urine sample and they’re going to check some hormone levels. We should get the results in about 3 weeks. We’re also waiting for another appointment to see the movement specialist at GOSH. Megan’s leg spasticity has worsened and is making things very difficult and uncomfortable for her. She gets upset and wants to know why she isn’t ‘normal’. We try and explain things in a way she understands but how do you tell a 6 year old that cancer has done this to her body. We don’t understand why this happened to her, so how will she. Megan will be going in for more spinal surgery on February 23rd. She is sitting very lopsided again and is uncomfortable so let’s hope they don’t cancel it again. Hopefully she will only be off school for a week this time. She is getting very upset about all the operations she has to have. She is questioning everything now and we are finding it really hard. On a brighter note, Megan will be having her 7th birthday on March 12th. We have organised a party for her on the 13th – she will have a disco, face painter and loads of games. She wants to invite friends from school, family, and all her wheelchair friends. I think she has reached about 50 on her list now. This will be the first proper party she has ever had as she always seems to be recovering from surgery around her birthday. Thank you for the continued support we receive from Post Pals. Joe and Megan save all their cards/letters they receive in special boxes and we all sit and look at them. Megan is also enjoying sending parcels to other Pals. A huge thank you for the handmade cards that Wendy sends to Joe and Megan. Thank you to Gemma for the bits she sent and also for the packets that Post Pals sent through. Joe and Megan loved the Thornton’s chocolates. December has been a very busy month for us all. On 5th December Mick and I flew out to Lanzarote for a week. This was our first ever holiday alone in the 16 years of being together. We had an amazing time and Joe and Megan stayed with my mum and sister. Joe and Megan were so pleased to receive posty while they were there. On December 17th we were lucky enough to go to the GOSH Christmas party. We have never been before and had a ball. They met lots of characters, ate loads of chocolate/sweets and played some games. They were also lucky enough to be given a Meerkat in their goody bag to take home. These were donated by Harrods and are exclusively made in honour of compare the Meerkat. We have had an amazing Christmas which we spent at my mums. Megan got a pink stereo, Hannah Montana things, make up, handbag, mobile phone (not from me, I think she’s too young), clothes, games, littlest pet shop stuff and loads more. Joe got an IPod, star wars monopoly, cd’s, dvd’s, clothes, games, and loads more. We bought them a Nintendo Wii between them which they play nicely together. Ulterior motive, I would like the Wii fit to try and shift some more weight, so we will all benefit from it. We have a lot of appointments coming up in January for Megan. Wheelchair services have supplied a new chair which seems to be going fairly well. We do however have to keep going back for things to be done. We’re seeing the local paediatrician, urodynamics, physio (we have a new one which isn’t going too well; we’ve only seen her twice in about 2-3 months). We are seeing the movement clinic at GOSH in January; this will be our first appointment with them so hopefully it will help. They deal with spasms, medication for spasticity, exercises etc. I feel we should have been referred ages ago as her spasms are really bad now. She is also being referred to a hormone specialist. She has developed excess body hair that is not normally found on a girl of her age. It could be early onset of puberty so we need to check things out now. Apparently it can be quite normal with spinal patients and although it causes no problems now, it will in later life. It’s just another hurdle for Megan to cross. I want to say a huge thank you to all of Joe and Megan’s elves, reindeers and everyone that sent gifts, cards and letters. I won’t name you all personally otherwise we will be here forever and I really don’t want to miss anyone out by mistake. Each and every one of you makes a huge difference to our lives. I hope you all had a fantastic Christmas and I can’t wait until next year to do it all again. Again, a massive thank you for all the cards that Megan, Joe, Mick and I, have received over the whole of December. Joe and Megan loved receiving their letters from the reindeers. In the first week before Christmas they were getting them daily and really enjoyed hearing what all the reindeer had been getting up to. A massive thanks to all of Joe and Megan’s Elves too. Megan received some arty crafty things, DS game, princess dressing up things, make up, hair bands, cd’s, tatty teddy, amongst some of them. Joe was so excited to receive the Guinness Book of Records and the JLS cd from Liz and Kate (one of his elves). We now know all the moves and words to the entire JLS album. Sorry for missing last months update. Megan is doing ok, we’ve had some appointments with the paediatrician and now we’re just waiting for a referral to a specialist that deals with spasticity. The appointment should be some time in January. We saw the spinal team and Megan had some more x-rays done, her scoliosis is still doing fairly well with the rods. She has grown so more surgery is scheduled for February 23rd, which is a day before my birthday, so I will wake up in a plastic sweaty chair on my birthday! Joe and Megan are really excited that they will be going to stay with their Nan and Aunty for a week. Mick and I are having a week in Lanzarote, so they will be doing the school run. We haven’t had a holiday on our own in the 16 years we have been together so are looking forward to it. Because of Megan’s needs, my mum and sister are the only ones that ever offer to have her. They have their school nativity next week so we’re hearing all the songs 10 times over now. Megan’s also learning Spanish at school so we’re getting jingle bells in Spanish, morning, noon, and night. We have also been called by the doctors for Megan to have her flu jab. I’m a little unsure if I want her to have it but don’t think I could forgive myself if she didn’t have it then got ill. This is booked for 15th December. I’m sure she won’t be very happy but we will be going to GOSH for their Christmas party on 17th December so hopefully this will cheer her up. I want to say a huge thank you for cards and letters that Joe and Megan have received. We have also started getting letters/cards from Santa and the reindeer. Joe and Megan love hearing what Santa and his reindeer are doing in the build up to Christmas, they are so excited so thank you to all you elves and reindeer out there. I hope everyone has a great Christmas and wish everyone great health for 2010. To everyone that send letters/cards/gifts to all the Pals, you make a huge difference to these kids and their families. Megan has had a fairly good month, although has been in a lot of discomfort due to an ill fitting wheelchair. I’ve spent the last 6 months chasing wheelchair services. Anyway, to cut a very very very long story short, we finally have a new chair. We picked it up on Monday and Megan loves it. She has customised it with tatty teddy stickers and spokey dokeys on the wheels. Hopefully she will be a lot more active now she has a super duper lightweight chair. We have had some adaptations done to the bathroom so hopefully Megan can begin to catheterise herself. She is still very upset about having to wear nappies as she is nearly 7 so it is a huge thing for her. We’re still getting all the questions about her disability and try to answer as honestly as possible. I’m sure it will get a lot harder as she gets older. We’re still waiting for an appointment at Great Ormond Street with regards to her spasms, they seem to be getting worse and her hips are very tight now. We also have a new physio who doesn’t know Megan or her strengths/weaknesses so i feel like I’m banging my head against a brick wall. Megan’s really pleased now she is back at school and in Year 3. She’s working really hard but enjoying it. On the other hand we have huge issues. Megan’s carer at school is amazing, they have a great bond and work really well together; however that’s where it ends. When Megan first started school everyone was very accommodating but now we seem to be a nuisance. She has to use a different entrance to all her friends as there is still no lift. We have been told that hopefully this should be done next year (we’ll see) by this point she will only have 3 years left at the school. Thank you to everyone who continues to send posty. We have had a really hectic summer and are now able to have a bit of peace now the children are back at school. Megan has been having weekly hydrotherapy with her physio and is really gaining confidence now. We are going to aim to take her swimming once a week to keep this up. We saw a Neurologist at GOSH to monitor the spasms she has in her legs. She didn’t receive the Botox when she had her spinal surgery and it has made a huge difference. Her legs are tight in the hips and they keep jumping about. She’s a little upset by this as it affects her balance etc. Anyway, she has been referred to another consultant that deals purely with spasticity so hopefully we won’t have to wait too long for the appointment. We’ve also learnt that the damage in her spine (caused by the tumour) is actually from T7-T12, not T8-T10 as we previously thought. It has only taken 6 years to be told after constant asking. She definitely has no feeling from her belly button down and will never walk. We always knew this but the harsh reality has set in after it being confirmed. We’re still waiting to hear about Megan’s new wheelchair. Funnily enough they always say they will call you with an update and we never hear another thing. She’s so big in her old chair now and it is holding her back and she’s unable to do things she had learnt previously. It is always a constant battle. On the whole we had a great summer. My sister got Megan a bunny for an early Christmas present. First she was called Martha but now it’s Rose. She’s very pretty with tall ears. Unfortunately, Megan managed to let Joe’s boy bunny get in her cage so now we have to wait and see if one new bunny will in fact be a lot more, so watch this space! Thank you to everyone who continues to support us and send Joe and Megan posty. It really does make a huge difference and we’re so happy to be able to share our lives with you. Thank you to Jane for the lovely postcards from Lanzarote, Joe and Megan loved reading about your holiday. Megan loved the pink sheep that Sarah sent her so a huge thank you. Megan’s favourite colour is pink and now he goes to bed with her every night. Thank you to Post Pals for the Egyptian set you sent Joe, he has been learning about Egypt at school and is really looking forward to doing it. Sorry for not updating last month, we found out that Megan was going in for spinal surgery and only had a week to sort ourselves out. Surgery went very well and we were home within 48 hours. We had a different surgeon this time and I have to admit I was a bit wary. However, he was amazing, his bedside manner was great. We have never had a surgeon come and see us after surgery and explain things. We will be going back in 6 months for a review and surgery will probably 9 months time. She was back at school after 2 weeks and has healed well. Joe and Megan have broken up for the summer now. We have just come back from New Milton with the Thomas Ball charity. We stayed at their lodge and had an amazing time. We didn’t have the best weather but we were really busy. We managed one day on the beach in Swanage which was lovely. Megan has been referred to the Neurologist at GOSH and we have an appointment in September. There is no-one in Megan’s care deciding when Megan should have Botox in her legs. She hasn’t managed to have it this time and her legs are very stiff and she’s having lots of spasms and the Botox normally helps. We have various other appointments during the next 2 months, wheelchair services is our biggest thing at the moment. Megan is definitely too big for her wheelchair now and were having problems trying to get a new one. Wheelchair services are teaming up with Whizz Kidz and are hoping to do split funding to get Megan the best chair available. I’m so pleased Whizz Kidz will be involved but everything takes so long. Megan has lost a lot of confidence in her chair as she doesn’t feel safe now. We have an appointment on August 11th to try 3 different chairs to see which is best for her; it is just how long they take to order and supply. Next week Megan will be doing a weeks wheelchair skills course run by Whizz Kidz. She is very excited about this as she did one last year and learnt lots of new things. Well, there are 5 weeks left until Megan starts in Yr 2 and Joe goes into Yr 5. Joe will be celebrating his 9th birthday on August 31st. I can’t believe they grow so much. Thank you for all the cards, gifts and letters that Megan and Joe have received this month. Thank you to the lady that sent Megan the fairy holder as she loves it. Megan’s Post Pals box is now bulging and we have had to get another one for all her letters etc. I can’t wait until she is older and we can sit together and read them again. Post Pals you do an amazing job, I can’t imagine not having you in our lives, especially when times are really tough. Thank you. Megan is going in for more spinal surgery on June 30th. We have been given very little notice this time which is a pain when trying to organise childcare for Joe. I hope she will be well enough for the Post Pals party. Megan has had a fairly unsettled month. We’ve had a few hospital appointments with the local paediatrician and they have all gone ok. Megan’s legs have started to spasm a lot more in recent weeks. We spoke to the doctor about her having some more botox when she has her next spinal surgery in July. We are doing lots of excercises and stretches but the tightness is getting worse. We have had to have an emergency appointment with wheelchair services as Megan is now far too big for her wheelchair. She fell out of the chair twice in a week and hurt her arm. We have had to borrow a wheelchair until we go for an assesment for a new one on June 10th. I hate the borrowed chair but hopefully it’s only short term. We’ve had a lousy half term. Joe and Megan broke up on the Friday and by the Sunday we were in A+E with Megan. She was very unwell and had a very high temperature. She appeared to have all the signs of scarlet fever, she had this when she was 3. Anyway, long story short, Megan had picked up scarlet fever for a second time. Our week was spent with the tv and antibiotics. We had a day at Littlehampton after 5 days which we all enjoyed. Megan’s nan has been in and out of hospital for the last 11 weeks with kidney stones, diverticular disease and eventually caught C-DIFF. Anyway, things have been tough but hopefully she is now on the road to recovery. It has been a long 11 weeks. Thank you for all the lovely letters/cards that Joe and Megan continue to receive, i really wish you could see their faces light up when the postman comes. A huge thank you for the bubbles that Megan received. She loves bubbles and had great fun with them. Sorry for not doing an update last month. Megan’s Nanny is very poorly in hospital and we just haven’t had time. She’s still in hospital after nearly 7 weeks, but hopefully will improve soon. Megan has had a few good weeks, enjoying the sun and has loved being able to go outside. She’s working hard at school and has so many friends who seem to look out for her. Wheelchair services have given her a new cushion for the chair as her pelvis is not in line with her trunk. This has been an ongoing problem that has gradually got worse. The cushion has helped a little but also caused a few problems as her chair is no longer able to fit under the desk at school so she is straining her neck. No one realised this was happening until she was having pain in her neck every day and needed to have pain relief. The school has ordered a height adjustable table so hopefully this should help. To be honest i think she needs a new wheelchair; she’s had the same size chair since she was 2 and is beginning to look a bit big for it. We have an appointment with the wheelchair services next week so I’m going to push for something new. We have an appointment coming up at Stanmore spinal unit this month for review. The OT’s and Physios are fantastic there and are so helpful with regards to equipment, exercises etc. Megan also has an appointment with her Oncologist at the beginning of June. She will have an Echo of her heart first and then get the results from the Oncologist. One of the chemos that she was on can cause heart problems but hopefully these should all be fine. Megan has started playing Boccia after school on a Monday. She really enjoys it and it gives her a chance to be with other children in wheelchairs. We still have issues with Megan wanting to wear knickers and not nappies and we deal with this on a daily basis and are hoping she feels more comfortable with the situation soon. She is becoming such a little madam and fiercely independent, which we encourage, but again it brings out more issues with things she can’t do. I’m sure things will improve but no doubt it will get worse before it gets better. Joe is feeling a little more positive about things; we’ve really tried to make more time for him without Megan. It’s tough and not always possible but again we will get there. Thank you to everyone that has sent posty to Joe and Megan, it really does go a long way to create two smiling faces. Even the postman knows all about Post Pals now! Huge thank you to Percy the poodle for happy post as Joe and Megan love hearing what antics he’s been up to. We’re also in the middle of growing our eggs that we received about a week ago, thank you Post Pals. Joe and Megan are having a competition to see whose the best is. We will send a photo when there all done. Megan loved receiving the Beatrix Potter cards too and she’s in the process of writing some notes. I also want to add a huge thank you to Viks and her parents for coming to see us on Megan’s birthday. Megan was a little down and we were having some tough times. Viks arrived at the house with some balloons for Joe and Megan and a Nintendo DS game for Megan. It was so lovely to see her and her parents and it really meant so much to us. Thank you so much Viks. Well what a month. Megan is pretty much recovered from her spinal surgery now. On the whole it’s been a quiet month regarding appointments for a change. We have a few issues at the moment with both Joe and Megan. Megan is very upset she can’t walk and doesn’t understand. She is also fed up of going in for surgery every 6 months now. The biggest upset at the moment is the fact she’s still wearing nappies. She can’t understand why her friends are wearing pretty knickers and she is still wearing nappies. We have bought her some pretty knickers to go over the nappy but that’s not good enough. I’m going to phone Stanmore and ask the psychologist to see her as they deal with this on a daily basis. Joe is also sad that Megan can’t walk and run and do the things he can. He feels he is missing out on a lot because Megan can’t do certain things. We try so hard for him not to feel left out but it’s so difficult to find someone to come and sit with Megan while we take Joe out. We get 2 hours a week from social services but to be honest it’s sometimes more of a hindrance as 2 hours isn’t really long enough to do anything. So we’re having issues with both Joe and Megan but hopefully they will be sorted out soon. On the plus side, Megan is celebrating her 6th birthday on 12th March. This is a huge milestone and something we never thought we would see. I didn’t for one minute think we would be sitting celebrating her 6th birthday with her by our sides. And on the plus side again, Megan has been off Chemo for 5 years now. We have a lot to celebrate this month. Thank you again to all who continue to send happy post – it does just that. A huge thank you to Julia from Austria for the packet you sent Megan. She loves the stickers. Also a very big thank you to Kim for the bits she sent through. Thank you to Post Pals for their continued support. Megan is cancer free for now but still has all her other problems as a result of Neuroblastoma, so thank you to everyone at Post Pals for making life happier for Joe and Megan. We’ve had a fairly quite month up until last week. Megan had spinal surgery to lengthen her spinal rods last Tuesday. We went for pre-op on the Monday and Megan was in good spirits, until they said they wanted to do blood tests. Anyway, long story short, why did they want bloods as they never have before? We spoke to the doctor who agreed it would be best for Megan’s bloods to be done while she was asleep in theatre. Tuesday morning we arrived at Dinosour ward and basically just had to wait. She was second on the list and didn’t actually go down until about 11am. Once again she amazed me at how calm she was. She had her pre-med (which she took herself) then laid on the bed while we waited for it to take effect. By the time the porter arrived she was being very silly and waving at everyone like she was the queen. She didn’t cry at all when she was having her anaesthetic and drifted off to sleep very calm. Surgery lasted about 2 1/2 hours and she definitely wasn’t calm when we got to recovery. The nurses gave her some Morphine on top of everything else she had and after a while she was comfortable and we went back to the ward. She slept on and off until about 6.30 the following morning, so had a good rest. Everything seemed to have gone well and we were allowed home later that day. Her pain has been a lot worse this time but today she seems to be a lot better. We have the nurses coming on Monday to remove the dressing and check the wound, something that Megan will scream at. The doctors have told us that she must have 2 weeks off school to fully recover, so she’ll back for a week before its half term. So that’s it surgery wise for 6 months. We have various appointments over the next few weeks though, so a busy time coming up. Thank you for the cards/letters that Megan has received. She really enjoyed getting the letter from Percy the Poodle and hearing all about his antics. A huge thank you to the lady that sent Joe and Megan the glo sticks too as they both had a lot of fun with these during the night. Megan is going into GOSH on Monday 26th January for her spinal operation. Hopefully we will only be in for a few days, depending on how things go. She’s aware she’s going in but is fairly anxious this time. It seems to get harder as she gets older, maybe she’s a lot more knowing. Joe and Megan were sooooooooooo excited to see themselves on telly last week, Megan got a bit embarrassed. A lot of the mums at the school have asked about Post Pals so hopefully some more post will be sent. Joe and Megan had a fantastic Christmas and were spoilt rotten. Santa bought Joe an electric guitar and Megan a keyboard, so our house was very noisy on Christmas day. We stayed at home and had my mum and sister and Mick’s mum over for dinner. Megan got a lovely Disney princess night light which has been used every day since she received it. She has now decided she wants a Disney princess bedroom, so I’m going to get pink paint tomorrow. Joe has also decided that he would like a Chelsea FC bedroom so we’re going to be very busy. Unfortunately Megan wasn’t well before Christmas; she had this fluey/sicky bug that was going around. After 2 weeks i took her to the GP who prescribed antibiotics and after a week or so she was a lot better. Joe has had a terrible cough so we may have to take him to the doctors next week. Megan is due for more spinal surgery later this month; I’m still waiting for a date. She is sitting very twisted again and is experiencing some pain to her back. I’m going to phone Great Ormond Street again tomorrow and try to find out when we’re in. I don’t think these doctors realise we have our lives to lead as well as be at their beck and call. I need to sort out childcare for Joe when Megan’s admitted. Well, tomorrow it’s back to school, yay! Megan really hates being away from school and is so excited to be going back. Because she was ill before Christmas, she missed the last week. We sent her in on the last day just so she could see her friends and her carer. It’s been 3 years running that she has missed all the Christmas celebrations at school, so I’m keeping my fingers crossed for this year! We have a few appointments coming up with the local paediatrician, wheelchair services, and Megan’s counsellor, so i will let you know how we get on in my next update. A huge thank you to Joe and Megan’s Christmas elves. They received some lovely presents, Joe got a Scooby Doo game, Dr Who tardis kit, Harry Potter goodies, sweets, and Dr Who stuff. Megan got loads of Disney princess stuff, night light, make up, sweets, crafty sets. The list goes on and on and a heartfelt thank you to everyone that sent post. Also, a huge thank you to Percy the Poodle that sent a parcel for each of them. I can’t remember everyone’s names personally, so I’m saying thank you to everyone in case i forget anyone. We hope you all had a good Christmas and happy New Year to you all. Megan has had a busy month. Half term week was spent on a wheelchair skills course run through Wizz kids. Megan enjoyed the week and it really taught her a lot as well as me. She has great skills and is now practising her back wheel balance. We need to aim for her to balance for 1 minute and then get up to 5 minutes and then do it with one hand. Megan is being admitted to Stanmore hospital soon for some intense physio and to possibly try a different type of back brace. I’m not sure how Megan will cope but we are willing to try anything. She is due for more spinal surgery in January so we have a bit of a rest. Joe and Megan are really looking forward to Christmas and Santa has a huge list. Joe would like an electric guitar and Megan a keyboard, so it’ll be a noisy house if Santa obliges! We’re going to see Santa on December 13th and they are both so excited (so am i but wouldn’t admit it to the kids)! A huge thank you to everyone that has sent Joe and Megan posty, they still wait for the postman everyday with a huge smile. Also a massive thank you to Hayley Gardner for the wonderful gifts she sent to Joe and Megan last week. Hayley is a relative of Samantha and Louis Hughes, she said she knew how much it meant to them to receive posty and wanted to send gifts to some children battling Neuroblastoma. It really means a lot that they are still wanting to make kids smile after there loss, so thank you. Megan is recovering well from her surgery in July. We have a bit of concern about the stitch at the top of the spine though. It doesn’t seem to be dissolving so we need to keep tabs that it doesn’t turn nasty. It’s beginning to look a little red so here we go again. Megan is now doing intense physio as her hips are quite tight. She had botox in her hips and this seems to be keeping things stable. We will see the spinal team at Stanmore on October 3rd to discuss the next steps. We also see the uro-dynamics team on the 6th October to do some bladder investigations, and we have an appointment with the eye specialist in November, so we have a very busy few months. Joe and Megan are now back at school and seem to be enjoying their new teachers. Now Joe is in year 4 he has a lot more work to complete – much to his disgust. Thank you to everyone that sent Joe cards on his birthday and Percy the poodle for his lovely present. I also want to say a huge thank you to everyone that continues to send posty to Joe and Megan. Many of you have been through a lot with us and you’re all still here making Joe and Megan’s day a little more special. Megan has had a very busy month. School is going really well and her report shows she is in the top of her class. Her biggest strength is Maths and this must come from dad as it is definitely not from me! Joe and Megan broke up a week early for the summer holidays as we went on holiday. We went to The Thomas Ball lodge in New Milton. 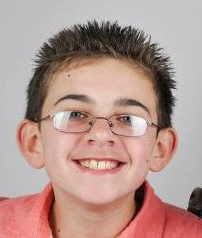 Thomas Ball lost his battle with Neuroblastoma when he was 14 and the charity was set up in his name. I think it was probably the best holiday we have had. This is our 3rd summer we have been there and will be going there next year. We have got to know the entertainment team who are fantastic. They treat Megan as an equal and include her in everything. Sammy seahorse is the mascot and Joe and Megan enjoyed singing and dancing with him every night. Megan was due to go in for more spinal surgery on 25th July but unfortunately this was cancelled by email (i was livid they cancelled by email and not a call). Anyway, she will now be going in on 28th July for surgery in the afternoon. We are all a little anxious as usual about surgery. We have explained she is having another op and she seems ok. Her true colours will show when we are at the hospital. As well as having the rods lengthened, the surgeon is going to inject some botox into her hip muscles. Megan has been having lots of spasms which are beginning to be uncomfortable. Originally they were going to snip the tendons but we’re going to try the botox first. She has a new piece of equipment which was supplied by Georgies fund. It’s a ‚Äòwheelabout’ which means she can be strapped in a standing position but still be able to wheel herself about. This will be very beneficial for her muscle tone in her legs and give her a lot more independence. I can’t thank Georgies fund enough for their generosity in this wonderful gift. Joe will be celebrating his 8th birthday next month. He’s very into Star Wars now and wants to collect the Lego Star Wars kits. He’s given me a huge list for his birthday. He seems to have grown up so quickly. I’m sure that due to Megan’s disability and illness he has had to grow up quickly, but i have to say he is not resentful at all and very overprotective of Megan. We were lucky enough to attend the Post Pals party and it was great to meet everyone. It was also great to meet some of the other pals and their families. Joe and Megan thoroughly enjoyed themselves and came home with loads of raffle prizes. I just want to say a huge thank you to Post Pals for everything you do. Joe and Megan run to the door everyday looking for their post, and it’s strictly off limits to me. You spend so much of your time doing things for the pals and their families and it’s wonderful. You are a huge part of all our lives and we thank you for everything. I will update as soon as Megan has had her surgery. Please think of her as she goes through this again. Megan has received lots of letters this month. Most of them are from a primary school in Brighton and a primary school in Somerset. Megan has loved receiving these letters and hearing about all the children that have been writing to her. Thank you to you all. Megan had her MRI at GOH last Tuesday and we went for the results Thursday 5th June. Megan’s oncologist is very happy with Megan and how she is doing. Megan has been off treatment for just over 4 years and the scan shows that the tumour has not grown or changed shape. We should have been moved to long term follow up but the oncologist isn’t ready to let Megan go yet, she definitely has a soft spot for her. So we will see her next time and then be moved on. Megan has to have some kidney scans and an echo done, but remains fairly well with regards to the Neuroblastoma. Spinal rods are and will always be an ongoing issue. We are back for more surgery to lengthen the rods on July 25th and she may also need to have an operation to cut the tendons in her hips. Her hips are so tight and we are doing lots of exercises to help this but they don’t seem to be working. We’re praying that if she needs this op then it can be done at the same time as the spinal rods are dealt with. The next piece of good news is Megan has some new equipment which should help the problem with the hips. Georgie’s fund have very kindly bought her a wheelabout, which is a sort of standing frame with big wheels so she can move about in a standing position. I can never thank Tania and the girls at Georgie’s fund for their generosity in this wonderful gift. Megan has taken to it like a duck to water and enjoys going in it. Life with Megan’s disability seems to get more difficult as she gets older but hopefully this will help a little. She’s doing great at school although we still have issues with adaptations, hopefully this will nearly be sorted when we go back in September when she will be in year 1. I’d like to say thank you to a little girl called Ellie who lives in Suffolk. Some time ago Megan received a lovely parcel of bits and a lovely letter from Ellie and her family. Megan drew a lovely thank you picture for Ellie and her little sister Beth, which i was meant to post. Unfortunately i lost the address and my computer crashed and i lost all my email addresses so couldn’t mail to ask for there address. If you see this please email me through the link at the top of Megan’s page so i can forward Megan’s picture. Megan has had a very busy month. She celebrated her 5th birthday on March 12th, a day we never thought we would see. We had a party for her on the Sunday with family. We got her a pink fairy castle cake which she loved. As usual she was spoilt rotten and couldn’t have asked for more. She received some lovely presents via post pals and loads of stickers. Megan can never have too many stickers; the wheels on her wheelchair are full of princess ones. We have had appointments with wheelchair services to try and find some suitable support for her chair that doesn’t restrict her movement too much. On Friday we will be going back to have a cast done of her back and make some sort of plastic support. We have an appointment at Stanmore Royal National Orthopaedic Hospital to see the spinal injuries consultant. We go there every 6 months and they’re excellent. We have also seen a rep about getting Megan a wheelabout, which is a sort of standing up wheelchair that she can self propel. We’ve tried 2 different ones and she took to it straight away. This would give her more independence and enable her to access so much more. We’re hoping to get some kind of charity funding, i won’t say too much in case it doesn’t work out, but will update you when i know more. We’ve had a busy month with physio sessions etc as usual. Megan has her next MRI and appointment with the oncologist in May, so fingers crossed the tumour hasn’t changes size or shape. A big thank you to Maria Carney for the lovely things sent for Megan’s birthday. Also a huge thank you to Sally, Owen, Beth and Ellie. They sent Megan some lovely bits for her birthday and a letter from Ellie. Ellie is the same age as Megan and they sent some pictures too. Megan is going to send Ellie a lovely picture to say thank you. The picture of Ellie and her little sister Beth is in Megan’s photo album. This really put a smile on Megan’s face. I can’t praise Post Pals enough. Since Megan’s problems all began as a result of Neuroblastoma, post pals have been great. They have supported us through lots of hospital admissions and operations. Joe always feels a little left out as Megan’s needs always have to be a priority. When posty arrives for him his smile is priceless. He spends a lot of time away from home and we miss him dreadfully. He loves receiving cards and letters etc when Megan’s having treatment or surgery. Thank you for making this possible. Megan has had a fairly good month health wise. The infection in her back is healing well although there is still one patch that’s a bit puffy. The spasms in Megan’s legs are quite bad now; i need to make an appointment to review her medication. We have to strap her feet down in the chair so that one of them doesn’t get trapped in the wheels. She’s been recast for her night splints so hopefully this will help a little. We have an appointment with a rep to show us some new equipment that should help Megan. We are looking at a wheelabout which is a bit like a wheelchair but she would be standing. We will also try a few other things to see which suits her best. We have a date for her next operation – July 25th. Thankfully it’s the school holidays so she won’t miss any school. We are going to New Milton on 12th July so at least she gets a holiday before having MORE surgery. Megan is doing great at school and has lots of friends. Her carer has been sick for the last 2 days so the school has had to muddle through on their own. We’re still going up to do the catheter, but the teacher goes on the training course next week, so hopefully we won’t need to go for much longer. Next Wednesday will be Megan’s 5th birthday. I can’t believe where the time goes. Another milestone in her life. Doctors said she wouldn’t be here and look how well she’s doing! Thanks for posty that is still being sent to Megan and Joe. Megan wheels herself to the door everyday to see if there’s anything for her. Megan is doing ok. Following her spinal surgery in December, Megan caught an infection in her wound. She was put on a strong course of antibiotics and now seems fine. We saw the spinal team at GOSH on Friday and they are happy with her progress. She can now start her physio properly again. She has been unable to do so much as she has been unwell but all systems are go now. We have a date for her next lengthening in July. We are away 12th July for a week and then she goes in for surgery July 25th. I’m glad as this means it will be done in the summer holidays so she won’t miss school. Megan is doing great at school and has loads of friends. It’s tough without all the adaptations but we’ll get there eventually. We go back to GOSH for an MRI in May and to see the oncologist. Thanks for the posty that you continue to send to Joe and Megan, it really helps to brighten their lives. A big thank you for the lovely drawing books and pens/pencils sent to Megan. She loves them. Megan had a tough month in December. She went in to have her spinal rods lengthened and an x-ray showed the rods had snapped. I phoned the surgeon and said i think the rods have snapped, of course they answered me as if i knew nothing. Anyway they phoned me back and said well spotted, they’ve snapped. She went in to have the old rods removed and a new one put in. The newer rods are a lot more heavy duty and hopefully will be ok for a few years at least. We asked if we’d done anything wrong and they said it just happens sometimes, Megan is just very unlucky. Her recovery was a lot slower this time and she was in a lot of pain. We were told that surgery will be worse as she gets older. Megan is now fed up with all her surgery and hospital appointments. She also wants to know why everything has happened to her. I’m unsure how to answer her, so she is having some counselling at school. Alison is really helping her through things. Unfortunately Megan is always going to be in hospital having procedures done. I want to wish everyone a happy new year and thank you to everyone that continues to put a smile on Joe and Megan’s face. Post Pals has made such a difference to Joe and Megan’s lives. Everyday after school, the first thing they ask me is “have we got any post today mum?”. A huge thank you to Joe and Megan’s Christmas elves this year. They were thrilled with their gifts. Megan was in hospital just before Christmas for spinal surgery, so all the cards and gifts really cheered her up at a tough time. We went to GOSH on Tuesday to have the pre-op x-rays ready for surgery on Wednesday. Unfortunately, Megan’s x-rays showed that the spinal rod had snapped. Only a 6% chance of this happening, but yes, my girl did it. Anyway, she has had to have a new rod put in so has been cut from her neck down to bottom. She is in a lot of pain and recovery is very slow this time. I can’t believe this has happened just before Christmas, not sure how long we will be in for. Hopefully out by the end of next week. A huge thank you for the cards and presents that Megan has received. They really have helped her to smile these past few days, although i have to say she’s probably only managed 1 smile. Also a huge thank you for the parcels that Joe received. He got 2 boxes with Dr who and Power rangers, he loved them. When we’re out of hospital i will forward the photos i have taken. Thanks again, you really are doing a great job. Not only for the sick kids but their siblings. Joe has felt left out this week and been craving attention so posty really helps him. Megan has had a few bad weeks. Her scoliosis has progressed and is causing her pain. We saw the spinal team who did an emergency CT scan as they thought the rod at the top of the spine may have dislodged. The scan shows the rod has indeed dislodged but there is now concern that the screw at the top has come out causing her the discomfort. Anyway, this will be sorted next week as we go into GOSH on Wednesday for more spinal surgery. Hopefully things will improve after this. We will be in hospital for about a week; I’m dreading it and find it difficult to see Megan in such pain. On a better note, things are going great for Megan at school. We still don’t have all the adaptations in place yet, but we’re getting there. Megan is looking forward to all her Christmas activities so i just hope she will be well enough to be there. A huge thank you to the lady that sent Megan the colouring book and pens/pencils. She has had loads of fun and i have lots of pictures on my fridge door now. Sorry i can’t name you in person, but Megan got excited and just ripped your details, sorry. Hope you’re all well. I just wanted to let you know that Megan will be going into GOSH next week for more spinal surgery. Firstly Mr Tucker will lengthen the rods and then they need to repair the dislodged screw at the top of her spine. The progression is very noticeable now and is causing her a great deal of discomfort. She is quite anxious about going back to hospital and really doesn’t want to go. I’ve tried explaining she will be fine but she remembers the pain she was in before. I know it’s going to get worse over the years rather than easier. Megan has had a very busy month with school and appointments. Her scoliosis has got worse and she has been in a lot of pain. The rods have dislodged in the top of her back and she needs surgery to sort that as well as making them longer. So she will have a few extra days in hospital and surgery is booked for 5th December. Due to the pain in her back she has lost a lot of weight in the last 2 weeks as she has not been eating. Her appetite the last few days seems to have improved slightly; hopefully we can begin to get back to our school routine. Megan is really enjoying school and has her own care worker Jackie. Jackie and Megan have really hit it off over the last month, Megan really trusts her which is great. Thanks for the letters/cards that Joe and Megan have received this month, they both still run to the postman to see what he has brought. Megan is doing ok at the moment. She’s having increasing pain in her back and arm, indicating the need for more surgery. She isn’t sleeping as she can’t get comfortable or move herself in bed. We are seeing the spinal team on 10th September so i will discuss these issues with them. Megan is due to start school on September 17th. This is a huge step for us all and something we never thought we would see. She is going to a mainstream school and will have full time support. I will update you all with how she does. Joe celebrates his 7th birthday tomorrow; i can’t believe my baby is growing up. Well until next time, thanks for the posty Joe and Megan receive. Huge thanks to SOLAK for the gorgeous quilt that was sent to Megan. She loves it and wants it with her all the time. They can’t wait to see the postman everyday to see if there is anything for them, so thank you to you all once again. Joe and Megan broke up from school 1 week early as we were going to stay in The Thomas Ball lodge in New Milton. We had a fantastic time and a well needed break. Joe and Megan spent every evening dancing with Sammy seahorse and friends. This is the 3rd year we’ve been there and we hope to be going next year. On July 7th it was my cousins wedding. Joe and Megan were to be pageboy and bridesmaid. The weather was lovely and the kids did a great job. Megan pushed herself down the aisle and all you could hear were the spokey dokies on her wheels going round. I have to say it was quite an emotional day seeing Megan; 4 years ago we were told she wouldn’t be here and look at her now. Health wise Megan’s not doing badly. She has been getting some pain in her right shoulder again if she’s laid on it too long or used it too much. The local pediatrician started her on an epilepsy medication for neuropathic pain 6 months ago, and she’s been great. I’m wondering if the dose needs to be slightly increased, we see the pediatrician in a few weeks so i will discuss this with her. It is very visible now that Megan has grown since her surgery in May, we see the spinal team in September and should find out when the next surgery is, I’m sure it will be at Christmas. Joe has got his first wobbly tooth; he discovered it last night and is very excited about how much the tooth fairy will leave him! It feels like he is really growing up now. Joe will be celebrating his 7th birthday on 31st August, thanks to everyone who takes the time to send something. Megan’s surgery on May 9th went well. The surgeons managed to lengthen the rods by 2cm’s which is a great success. Following surgery Megan was in a lot of pain for a few days but she’s now back to her usual self and back to school. She will have to go in for more spinal surgery just before Christmas. Her latest MRI showed no evidence of disease which is fantastic, she will have another MRI in a year but we will go and see the oncologist in 6 months. Things on the school front are improving. I have a meeting with the LEA today for a mediation meeting. The LEA have agreed to half fund a hygiene room at Joe’s school if the school pay the other. This shouldn’t be a problem and we’re just waiting for the rubber stamp of approval. So after fighting for 2 years, i think we have finally got there. I will let you all know. Megan is looking forward to being a bridesmaid for my cousin Emily next month and we’re just sorting out hair and everything. Megan keeps telling everyone she is going to be a princess. Well until next time, thanks for sending Joe and Megan things through the post and I’m not sure who to thank but we received 4 parcels all from John Lewis when Megan was in hospital. Two gifts for Megan and one each for Joe and me. So whoever you are, thank you very much. Megan is doing ok at the moment. We have had lots of appointments lately. Megan had her MRI scan done on 17th April, we saw the consultant for the results and they all came back clear. We will see her again in 6 months and then have 1 more MRI done in a year’s time. She feels the chance of relapse is quite small now, although never say never. Megan goes in for more spinal surgery on May 9th. She has grown so much that she is quite curved again; she is definitely ready for the rods to be lengthened. Hopefully she will only be in hospital for 3-4 days. We’re still fighting with the local council with regards to Megan’s reception class in September. We have still been refused a place at Joes school so i am going to a tribunal in June, fingers crossed. Thanks for the cards Megan has received, it really does put a smile on her face. I will update when we get out the hospital. Megan saw the spinal team last Monday and she will be having an MRI of her neck done when she has the oncology checks done. Her pain is much better now, but she still complains from time to time. She will be having surgery again in May to lengthen the rods. Time goes so quick, were only just sorting out the problems from the last surgery. On a better note Megan got her new chair. She is now a very independent little lady with attitude. I can’t believe how different she is since getting it. Well i suppose she is 4 in March. I still think of her as my baby. Anyway thanks again for all you do, you’re all great. Results were good. There is no sign of active Neuroblastoma. The tumour will always remain there as it cant be removed. She will be scanned again in April and see how we go from there. We see the spinal team on Monday to discuss the pain issues. Unfortunately Megan was quite poorly in the lead up to Christmas. She was running an extremely high temperature and was generally unwell. We were admitted to Great Ormond Street. The spinal surgeons thought maybe her spinal rods were infected. She was scheduled for an MRI. The doctors started her on iv antibiotics and her temp started to come down and she felt a little better. The MRI showed no fluid or puss around the rods which is great. However they noticed that the tumour in her spine had grown a little. We had to see the oncologist to discuss things. They tested some urine for VMA which came back normal. This can be an indication of Neuroblastoma, although not always. Her oncologist doesn’t feel that the Neuroblastoma has flared up again but she ordered an MIBG scan to be done. This will tell us for sure if anything has returned. Her scan will be done on January 3rd, please keep everything crossed for us. We managed to make it home for Christmas. They let us out Christmas Eve, the best Christmas present ever. We had a fantastic Christmas and the kids were spoilt rotten. Thank you to everyone that sent gifts for the kids. I’m sorry i can’t mention everyone but as we were in hospital my neighbours were getting my post and sorting it for me. Unfortunately some tags went astray. A huge thank you to everyone that sent gifts to Joe and Megan for Christmas though. An extra special thank you to Megan’s Christmas elf Beanie. Megan loved receiving her big box of gifts. I wanted to thank you personally but mislaid your email address. Thank you to everyone that sent cards for Joe and Megan. They loved receiving cards from the reindeers and ran to the post every morning. Wishing you all a very happy New Year and thank you for your continued support in keeping a smile on sick kids faces. Megan was discharged from GOSH on Christmas Eve, so at least we managed to make it home for Christmas. She’s doing well at the moment although were still waiting for some scans to be done. We were told last Wednesday that Megan’s tumour in her spine has got bigger. The oncologists don’t seem too concerned at the moment, although were not quite as relaxed as they are. She is scheduled to have an MIBG scan on 4th January. Fingers crossed everything will be well. As far as her being poorly goes they are still not sure what the problem was. Blood tests show that she has a severe infection somewhere but no-one seems to know where. The MRI showed no signs of fluid or puss to the spinal rods. They say that maybe she has a deep seeded infection. She went to theatre last week and had a pic line put in. She is very difficult to get a cannula in, and this has also made her terrified of doctors/nurses coming near her now. Anyway she is on oral antibiotics until January 15th, we will see the spinal team on that day and then she will have to remain on oral antibiotics for a further 3 months. I want to thank you for your hard work over the last year. It has really put a great big smile on Megan’s face to receive posty, also Joe has been very lucky to receive a few bits. He has been unintentionally left out lately and this makes him feel like a special boy, so thanks again. I will let you know when we have the MIBG results on 11th January. We’re praying for no Neuroblastoma cells to show up and will hopefully find out why the tumour is growing. Megan is continuing to do well following her recent spinal surgery. We saw the surgeon on 24th November and they don’t want to see her until May, yey! We have had an ongoing battle with wheelchair services. She needs a new wheelchair and it cost over ¬£1000. Well a few hissy fits saying i couldn’t cope without a new chair seemed to help. Her new chair should arrive in 6-8 weeks. The council has refused to adapt Joe’s school ready for Megan to start there in September. It will cost over ¬£200,000 and i know it’s a lot but i feel it’s important for her to be with Joe and why should Joe move? I’m going to fight to the bitter end, and if need be take the local council to tribunal. I feel as if she’s being discriminated against because she has Neuroblastoma. Well we’re all prepared for Christmas. I’ve nearly finished my shopping and the tree and decorations went up at the weekend. I know I’m early but Joe and Megan hassled me for hours. Megan is so excited this year; she’ll be 4 in March so knows more of what’s going on. She keeps telling me she wants Minnie Mouse and Cinderella for Christmas so she’s been quite easy to please. Joe just wants Dr Who, pj’s, pants, socks, so again Christmas is quite easy for me this year. We have Megan’s next MRI scan on January 2nd, and results on 11th. Scan time is so hard especially as time goes on. We thought it would get easier but NO. Let’s just hope that nasty tumour is still not growing. Well have a great Christmas one and all! Thank you to everyone who sends posty to Joe and Megan. Julie and Allan Barrett, Kate Dee, Laura and Chris for the doll, she loves it. A huge thank you to Megan R for her lovely gift to Megan. Megan loves receiving posty and really enjoyed the stamper and especially the Cinderella notebook and pen. She keeps telling everyone she has a diary now. Megan is recovering really well following her spinal surgery. Her scar is healing really well and the stitches have nearly all dissolved. We will see the spinal surgeon for a follow up on November 24th. She will return to nursery on the 27th November all being well. We are trying to organize a new wheelchair for Megan, but of course the problem will be the funding. We’ve just received the letter regarding Megan’s next MRI scan. It has been booked for January 2nd; hopefully the hangover will be gone by then! 😉 We will get the results on 11th January. The longer she has been in the clear the slimmer the chances of it coming back. Well we’re all looking forward to Christmas. Joe only wants Dr Who and Megan wants everything in sight. The year goes by so quickly; i can’t believe it’s nearly Christmas again. It will be the 2nd Christmas without my dad. I want to say thanks to everyone that continues to send posty to Joe and Megan. I can’t remember everyone by name but you really make a difference to Joe and Megan. Megan’s operation last week was cancelled. We were all prepared to go in and then with 24 hours to go they cancelled. No explanation – i was just told something came up. Anyway, Megan will be now going in to hospital tomorrow for surgery on Friday. We’re not looking forward to this operation, but she is in a lot of pain. Although initially she will be in a lot of pain, she should feel much better after. Megan has now started at main stream nursery. She is really enjoying it, although the nursery have realised how much extra support is needed. We are now trying to start the statutory statement to get her extra support at school. Her teachers are really supportive to all her needs. Our trip to EuroDisney was great. We can’t thank the children’s magical mystery tour enough. This organisation has been taking sick kids to EuroDisney for 13 years now. It’s quite an experience to see over 100 black cabs, police bikes, ambulances, AA and convoy vehicles all following each other down the motorway. The police bikes were stopping everyone at red lights and the motorway junctions so the convoy wasn’t broken. It was a very breathtaking experience. We all had a great time but were very tired when we came home. Our cab driver Mick stayed with us for the whole trip and helped us around the park. Megan and Joe would like to say a big thank you to everyone that has sent posty this month. Big thanks to Kate Dee and Julie and Alan Barrett. I can’t thank everyone but you know who you are. We just wanted to let you know that Megan will be having spinal surgery on Friday 29th September. We will be admitted on 28th. She will be in hospital for about 7-10 days. This will be 3 years to the day since she was diagnosed with Neuroblastoma. We are of course anxious about this but know it needs to be done. Megan is having quite a lot of pain at the moment with her spine. I’m sure this hot weather doesn’t help. She’s taking more codeine to try and ease the pain. We go for pre-op on August 11th, so we should know when she will be having surgery. Although I’m 100% that it will be September. We have just returned from New Milton where we spent a week at the Thomas Ball holiday chalet. We had a great time and Joe and Megan enjoyed singing and dancing with Sammy Seahorse. Megan will be starting nursery in September. We’re still battling to find a suitable school for reception next year. Why can’t people see past the wheelchair and realise that Megan is a normal little girl? Things are very stressed at the moment. Well i hope everyone is having a good summer. Joe will be celebrating his 6th birthday on August 31st. We’re going to try and make it really special after last year. My dad’s funeral was the day before so we didn’t feel like celebrating, so we must make it special this year. A big thank you once again to Julie and Alan Barratt. Joe and Megan really look forward to racing for the postman. Megan is doing ok at the moment. She is still having trouble with the back pain, due to the scoliosis. She will have her pre-op appointment in August, then all systems go for surgery in September. I’m dreading this but it needs to be done. We’ve just been reviewed by the uro-dynamics team. Megan is still wet in between catheters, so they have decided to increase her medication and given her bigger catheters. If the medicine doesn’t work then we will have to increase the catheters to every 3 hours. Nothing else on the health front really. I’m battling with the education department at the moment to find suitable schooling. I didn’t realise how stressful this would be. Every school mentions inclusion, but that’s as far as it goes. I will keep you all updated. We’re going on holiday on the 8th July. We’re staying in New Milton at the Thomas Ball Charity holiday home. We are looking forward to getting away, and its lovely there. Thank you to everyone who continues to send posty to Joe and Megan, they get very excited when the postman arrives. A big thank you to Julie Barrett, who continues to send lovely little things for Megan. Just to let you all know that Megan’s scans have come back all clear. There is no sign of any disease. A great weight has been lifted. She will have another scan in November. Megan is doing great at the moment, although she seems to be having a lot of pain due to the scoliosis. We have seen the GP and he has written to the surgeon regarding her surgery. The local paediatrician has also prescribed some Codeine for the pain. Hopefully this will help. Megan had her MRI scans last week to check that the cancer hasn’t returned. We will get the results on May 18th. The catheterisation is working well and Megan doesn’t seem bothered by it at all. On a great note Megan has been asked to go on the magical taxi tour. This is where 100 black cabs take sick kids and their families on a magical tour. We will be going to Euro Disney on September 15th. This is a massive event that gets a lot of publicity worldwide. Last year the cabs were in a convoy on the motorway for 3 miles. I’m sure it makes great viewing and it is something for us all to look forward to. Megan’s lift will be fitted this week; this will make life so much easier for me and Mick, and give Megan a lot more independence. She needs to be doing things on her own as she does get very frustrated having to rely on everyone else. Anyway until next time i want to say a continued thank you to everyone who sends posty to Joe and Megan, it really makes their day. I would like also like to say a great big thank you to Julie Barrett. She sends some lovely posty to Joe and Megan; also her parents sent a lovely huge doll to Megan. She has named her Emily and insists on taking her to bed with her every night. Just wanted to let you know how Megan’s is doing. We now have to catheterize her. We have spent 2 days at Great Ormond Street for training. At first Megan wasn’t too keen, but she has adapted really well to her new routine. She will be having her spinal surgery in September. Her spine has now progressed to 60 degree. The surgeon wants to insert some spinal growth rods. She will then have to have the rods lengthened every 6-12 months as she grows. She will then have her spine fused when she is a teenager. I’m not looking forward to this but it has to be done. I want to say a big thank you to everyone that sent gifts and cards for Megan’s birthday. I must admit i have lost count of the number of cards she received. I would also like to say thank you to everyone that sent a little something for Joe. It meant a lot to him while Megan was being spoilt rotten. She had a great day with loads of pressies and a small party for family. Look forward to updating you all soon. Megan is doing well at the moment. She had a review at Stanmore earlier this month. They seem pleased with her progress. They did talk about botox injections in her ankles because she has lots of spasms. Megan was seen at Great Ormond Street yesterday by the spinal surgeon. Her 40 degree scoliosis has now progressed to 60 degree’s in just 6 months. He has decided he wants to get her in for surgery. They want to put in spinal growth rods that will grow with her. This means she will need surgery every 6-12 months to lengthen the rod, as she grows. There is a 6 month wait, but I’m sure that will arrive really quickly. Megan will be celebrating her 3rd birthday on Sunday 12th March. This is such a big milestone considering she was so poorly 2 1/2 years ago. Not much planned really, just lots of presents and cake. A big thank you to everyone who continues to send cards and gifts. It really means a lot to Joe and Megan. Just wanted to let you know Megan has just had her MRI and the results came back all clear today. The remaining tumour is not active and hasn’t grown at all. This is great news as we were sure she might have relapsed as she has been so unwell lately. Catheter training next week and back to see the spinal surgeon in March. I’m sure he’s going to want to do surgery. Megan is doing ok at the moment apart from suffering with a really bad cough and cold that she seems to have had for ages. She is finally on antibiotics. Euro Disney was great; we met loads of the characters and had a great time. Thank you to The Thomas Ball Charity for making the trip possible. We had a really good Christmas, although it was strange my dad not being with us. Megan is due for her next MRI scan on January 11th, we will get results on the 19th. Then we are back to Great Ormond Street on January 23rd and 24th for catheter training, something I’m not looking forward to but has to be done. I would like to say a great big thank you to Sally Barrett who was their Christmas Elf this year. We received a HUGE box for both the children. The children loved opening all the presents from the Christmas Elves. Also a great big thank you to everyone else that sent them gifts. I wish everyone a great new year and hope that 2006 is a better year for us all. Just to let you know we are going to Euro Disney on Thursday. This trip has been organised through The Thomas Ball Charity. Three magical days with Mickey, Minnie and friends. Megan is doing great, but had a slight ear infection last week. Will update when we return. Megan is doing really well at the moment. She seems to have got over the scarlet fever really well. Great Ormond Street have decided that we will start catheterizing Megan. We go for training in this procedure on January 11th. Friday 25th November we are going to stay in New Milton at TJ’s. This is the new lodge recently purchased through the Thomas Ball charity. We went in the summer but had to return early due to my dad being so unwell. Anyway the charity have offered it to us again for the weekend. We are really looking forward to it. Nothing else to report really. We have no hospital appointments until January now, yey. This will be the big one though. It will be her MRI to check the remaining tumour in her spine hasn’t changed at all. We hate scan time, its a really scary time. I look forward to the next update, i can let you know about the break we’re having. We have spent the whole day at casualty with Megan. She was running a high fever for 2 days and developed a nasty blotchy rash. Anyway after waiting 8 hours we were told that she had scarlet fever. I would like to say a big thank you to anyone who sent posty to Joe and Megan. My dad lost a short battle with cancer in August and posty has really helped them both. Megan has recently had her 4 monthly MRI scans. They all came back clear, which means Megan is till NED. She also had some bladder scans done which so that she does have some bladder control. We have to wait to meet with her urologist but hopefully this means we wont have to catherterise just yet. On a downside, Megan’s scoliosis has progressed. The spinal surgeon will see her in 6 months and if there is more progression she will have surgery, to have a spinal growth rod. Again a big thank you to everyone who sends posty, it really brightens their day. The good news is that Megan’s scans all came back clear. It has been such a tough few months we needed some good news. Also her bladder assessments show she has slight bladder control which is great. We have to wait for an appointment with the urologist but we had good news all round. What a fab thing you do. Joe and Megan enjoy getting parcels/envelopes for them, it makes them feel special. I want to say thank you to Kate, Sue and Lorna for the lovely gifts. Megan is doing well. She finally got her wheelchair, its only took 10 months! She’s learning really quickly. Her tests at Great Ormond Street were cancelled as she had an infection. These were bladder tests and are very important, so I have to change for another appointment. Now it’s the school holidays, we are all looking forward to a holiday in August. We are going to Hampshire for a week and can’t wait. The holiday has been donated by the Thomas ball charity. We are so grateful for their generosity. I can’t wait to let you know all about it. No more hospital appointments for 4 weeks (that’s a first!). The next MRI is scheduled for September, so that will be a tough time. We are looking forward to Joe’s birthday at the end of the month. We have booked a party at the local ball park for him and his school friends, they both really enjoy going there. We are back at Great Ormond Street 4th July to have pre-op assessment for the following week when she will have the pubic lines put in to check the proper function of her bladder. We will be going in on the 11th july and have to stay over night in the patients hotel. More tests will be done on July 12th. We are still waiting for an appointment with Megan’s Neurologist. Her appointment was cancelled when she had chickenpox.